These are the unique ones which flairs the emotional connect of every bride on the D Day, bridal sets covers a wide range of necklace set with matching earrings, rings, bangles and maang tikka. 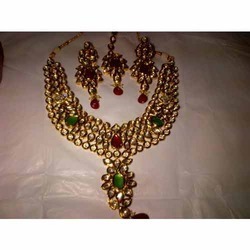 Bridal Set covers a huge part Indian traditional Jewellery, we have a wide range of bridal sets with different metals and materials used – Polki Bridal Set, Kundan Bridal Set, Jadtar Bridal Set, Semi-Precious Stone Bridal Set, Color Stone Bridal Set, CZ Bridal Set, Evening Party Wear Bridal Set, Solitaire Bridal Set. A stunning and embellished range of Fashionable Bridal Set offered with diamond and kundan beads, with Solitaire Bridal Set. 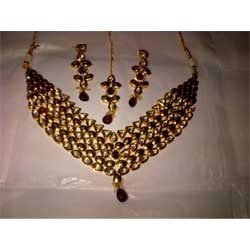 We have made them available in glittering in variety of designs and patterns.